Want to save time and reduce component counts for PoE DC/DC Power design? 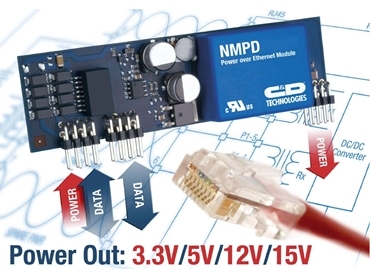 C&D Technologies introduces the industry’s first fully integrated Power over Ethernet PD interface. These Compact, IEEE802. 3af-compliant modules with onboard isolated DC/DC converter remove the need for localised power source in PoE applications. Range of output voltage options (3.3V, 5V, 12V and 15V versions).